Electric cargo bikes are bikes and bicycles operated and powered by portable batteries such lithium ion and nickel-based batteries. The electric cargo bikes considered in the scope of research are two-wheeled electric cargo bikes, three-wheeled electric cargo bikes and four-wheeled electric cargo bikes. The global electric cargo bikes market is estimated to be valued at US$ 402.7 Mn by the end of 2018 and reach US$ 1,095.2 Mn by the end of 2026, registering a CAGR of 13.3% over the forecast period. The global electric cargo bikes market is anticipated to represent an incremental opportunity of US$ 692.5 Mn between 2018 and 2026. Electricity used in electric vehicles & bikes is stored in the form of chemical energy in the batteries. These batteries are recharged by the transmission of electricity from an outside source, which is primarily done in plug-in electric bikes. The main source of electricity for rechargeable batteries is the overhead line of grid network of any area, which mainly supplies electricity produced from coal and renewable sources. Development in the automotive & transportation industry has harshly depleted nonrenewable petroleum reserves, causing a rise in fuel prices. This rise is expected to be exponential in the coming years as crude oil reserves will be reduced, which will lead to high demand and pave way for the growth of vehicles running on alternate sources of energy. Additionally, the consumption of petroleum products as fuel in the automotive sector is increasing day by day; thus, to reduce this global consumption, manufacturers and governments are promoting the use of alternatives such as electric cargo bikes, which are far more fuel efficient as compared to conventional cargo bikes. Tailpipe emission is thought to be the major concern associated with gasoline and diesel powered bikes. Compounds of nitrogen oxide, carbon monoxide, unburnt benzene, particulate matter, carbon dioxide, etc. along with other unburnt harmful airborne chemicals are released into the atmosphere from such vehicles. The uncontrolled emission of these chemicals into air pollutes the environment severely and in turn causes several life threatening diseases to living beings who breathe this polluted air. On an average, a gasoline engine bikes releases over 250 grams of harmful chemicals, including carbon dioxide per kilometer travelled, or equivalent to over 4,750 kilograms of harmful pollutants per year. This pollution rate can be brought down if customers opt for electric cargo bikes, which are less polluting and far more efficient than conventional gasoline cargo bikes. The global electric cargo bikes market can be segmented on the basis of product type, battery type, end use and region/country. On the basis of product type, the global electric cargo bikes market has been segmented into two wheeled, three wheeled and four wheeled. On the basis of battery type, the electric cargo bikes market has been segmented into lead based, nickel based and lithium ion. Based on end use, the electric cargo bikes market has been segmented into courier & parcel service provider, large retail supplier, personal transportation, service delivery and waste municipal services. Significant regions covered in the electric cargo bikes report include North America, Latin America, Europe, China and the Rest of World. By region, Europe is estimated to dominate the global electric cargo bikes market. The Europe electric cargo bikes market is expected to gain 420 BPS between 2018 and 2026. Moreover, the region is estimated to remain a high growth market throughout the forecast period. It is projected to grow with a CAGR of 14.2% over the forecast period, primarily owing to the increasing production of electric cargo bikes. By battery type, in terms of volume and value, the lithium ion segment is estimated to lead the global electric cargo bikes market throughout the forecast period. For the lithium ion segment, Europe is one of the most lucrative regions as the region accounts for almost 82% of the total sales. The lithium ion electric cargo bikes market is expected to create an incremental $ opportunity of US$ 560.6 Mn between 2018 and 2026 in the global electric cargo bikes market. By end use, in terms of volume, the courier & parcel service provider segment is estimated to be pegged at 41,939 units in 2018. 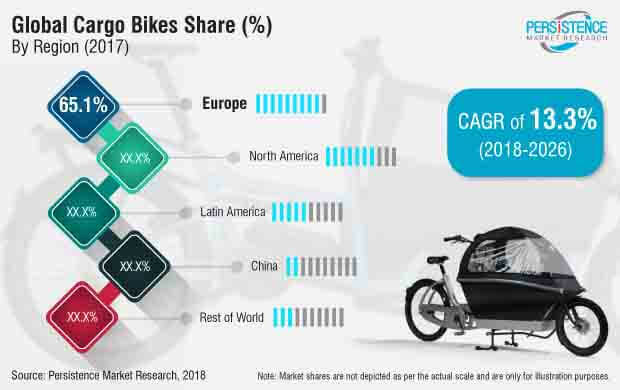 This segment is expected to grow with a CAGR of 13.3% between 2018 and 2026 in the global electric cargo bikes market. The personal transportation electric cargo bikes segment is projected to create an incremental $ opportunity of US$ 153.1 Mn over the forecast period. By product type segment, PMR forecasts that the three wheeled electric cargo bikes segment is projected to reach US$ 566.6 Mn in 2026 from US$ 193.0 Mn in 2018, representing a compound annual growth rate (CAGR) of 14.4% from 2018 to 2026.